The practices used to raise Carman Ranch premium meats restore the soil, respect the animals, build sustainable communities, and grow nutrient dense, delicious food. 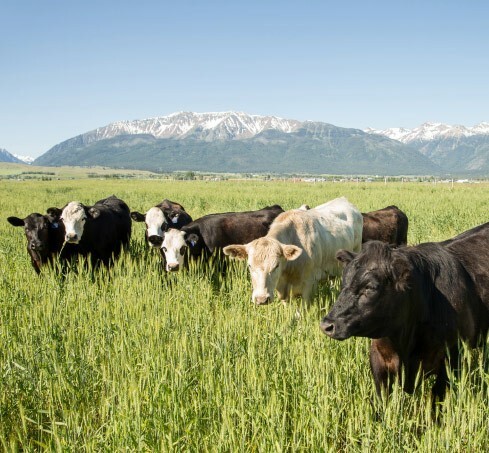 We work with a collective of family ranches using holistic ranching practices on the pastures and prairies of the Wallowas, where our families have raised livestock for more than a century. Today the Carman Ranch ecosystem supports our ranchers and like-minded suppliers, butchers, chefs, and others who make the world a more healthy, sustainable, and delicious place. Carman Ranch is proud to be a leader in the regenerative food revolution. How is Carman Ranch meat processed and inspected? Our meat is processed and inspected at Kalapooia Valley Grass Fed Processing in Brownsville, Oregon. Built in 2013, the facility was owned and operated by Anderson Ranches Grass Fed Lamb, a fifth generation family ranching business that wanted to do their own on-farm processing. Onsite USDA inspectors oversee the daily processing and packaging of all products for safety and compliance with government regulations. Isn’t all grassfed beef the same raised to the same set of standards? There’s a lot of overlap between organic and grassfed cattle. The certification is more about how they’re raised than what they eat. The main difference is that organic cattle can be fed a diet of corn and/or grain. How are Carman Ranch animals raised? Information about how each product is produced can be found by scrolling down to the Protocols section below the product description. Click on any protocol for its definition. How is 100% grassfed and finished beef better for you? - Contains more of the “good fats”: omega 3 fatty acids and conjugated linoleic acid (CLA), which lower "bad" cholesterol and fight heart disease, and may have cancer fighting properties, lower the risk of diabetes and other health concerns. - Lower in fat and calories. How is sustainably raised 100% grassfed and finished beef better for the environment? Is Carman Ranch certified organic?